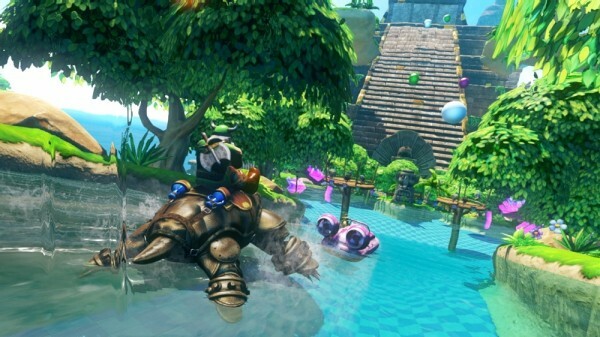 Famitsu reports that SEGA has announced a Japanese release date for Sonic & All-Stars Racing Tranformed. The game, which released in the West on November 2012, is due for release on the Wii U and Playstation 3 on May 15th, 2014. While Famitsu’s article does not mention any exclusive characters for the Japanese version, it would be interesting if SEGA included Ryo Hazuki or Hatsune Miku in an attempt to appeal more to Japanese audiences. One interesting bit of information is the mention of Takenobu Mitsuyoshi being “the voice of SEGA”, could the Japanese version be adding an announcer or theme song to the game? We’ll reach out to Sumo for more info on this and the Japanese release of the game. Stay Tuned! Exciting news to see SEGA Japan take a strong interest in this franchise all of a sudden. Hopefully it means they might get involved with future Allstars title so we could have their more Japanese series (Yakuza, Phantasy Star, Puyo etc) appear in future updates! Oh man if Takenobu Mitsuyoshi writes new music for this I will be a very happy man. Somewhat related, but I came upon this through GAF, and it was amazing. I’m happy to see Japan get a taste of SASRT. Unexpected, but a great surprise! Little rough start, but once they get cooking it’s real good.